Now that I've made peace with the idea that Fozzie may be sticking around, I've experienced this burst of joyful energy about getting him the training and attention he needs. What was a burden before, when I contemplated the necessity of doing it for someone else's benefit, is now a fun project as I think of how great it will be for us. As many of you helped me realize in your wonderful responses to my recent posts on Fozzie's reactivity, Fozzie desperately needs regular walks with other dogs and understanding humans. I know that groups like B-more dogs that put on walks for pit bull-type dogs to go out together, socialize, and be ambassadors for their breed. 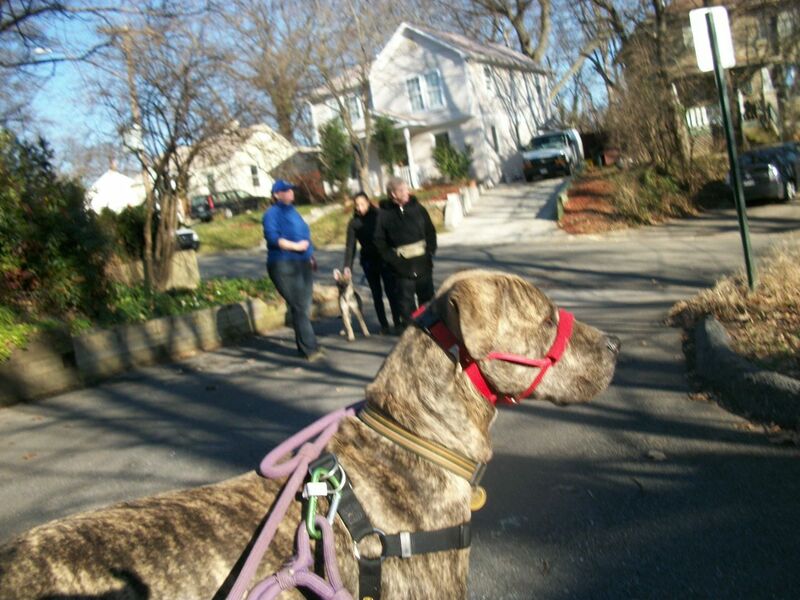 There are also organized walks for pit bulls who would not necessarily be the best breed ambassadors because they happen to have some leash...issues, but who benefit from community dog walks. I tried to track down similar amazing organized pit bull walks in the DC area, and came up with nothing. Fortunately, we do have Francine. Francine is my good buddy and fellow dog trainer. 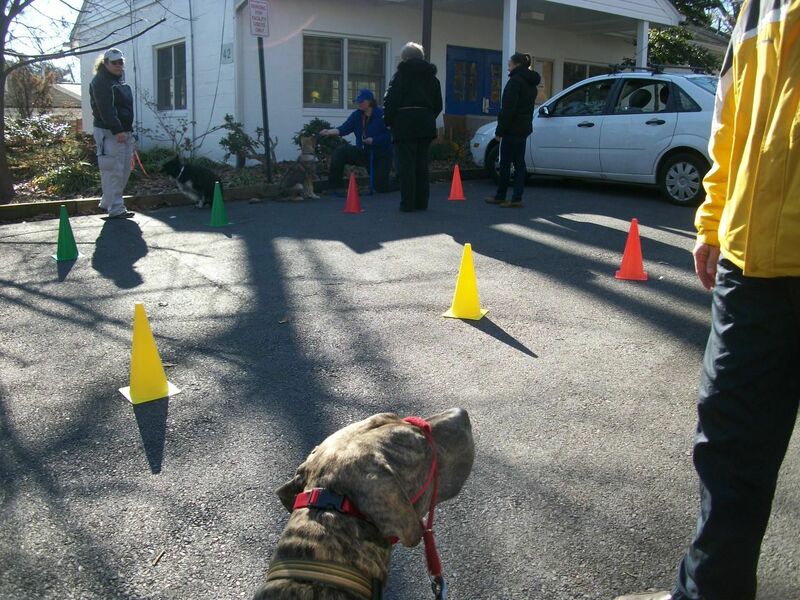 When I told Francine about my need for organized socialization opportunities for Fozzie, she welcomed me to her classes that take place just down the street from me. On a gorgeous Saturday afternoon Fozzie and I suited up in our dual-attachment leash, head halter, and step-in harness and went to join Francine, her partner Karen, her frequent companion Jubal--a border collie whose parents are always traveling--the gorgeous Shepherd puppy Rocky, and his humans. There was some initial lunging and loud barking, at which I quickly directed Fozzie's face away from his two classmates. After that, he didn't exactly become Mr. Mello Yello but he did look at me when I called him and eat his treats in full awareness of other dogs not 15 feet away from him. He did a nice Paws up on a scrap of flooring Francine brought, and he walked around some traffic cones, and he generally was able to focus on me and what I asked of him. Huge progress! Its great to read that training and helping Fozzie is now a fun project! With your mindset this way you will both move forward positively, he will pick up and respond to your new joyful energy. Well done to you and Fozzie for his progress. That's great to hear about your progress. I have a reactive border collie puppy that I had initially hoped would take my older dogs place as a Therapy Dog. Once out of the shelter he turned out to be the opposite from the calm confident pup I found in the shelter. But I still keep my goal to get him into Therapy Dog work, it just takes lots of effort, training and patience. Socialization around understanding people makes a huge difference. I take him out to meet people a lot, but the average person doesn't understand our training efforts and either makes things harder or just ends up walking away. Finding that perfect environment to work with them is a struggle, but well worth the effort once you find it.